Under the leadership of Superintendent of Police Sandeep Patil, the Traffic Police Belgaum page has become super hit in just 4 days. The page was launched on 9th May at 8 pm. At the moment there are 604 people who have liked the page which is good number. 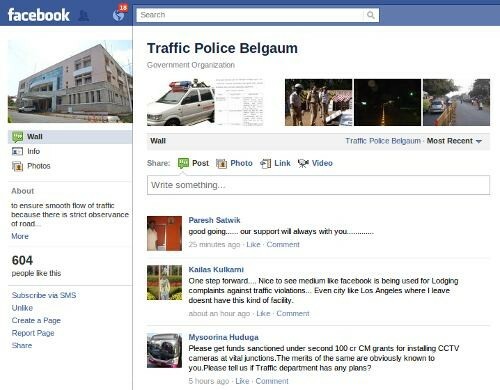 From the minute the page was launched AAB was the first one to initiate the requirement for the page earlier this month (When will Belgaum police go the Delhi traffic police way)and heeding to this the Traffic Police Belgaum page was born. The page has seen numerous complaints from people right from a complaint of no meters in Autos, to someone hitting and going. People were happy enough to share the local problems from their locality like the one from Bapat Galli where there is a huge traffic problem as the vehicles are not parked in a proper manner. In response to this query, A constable was sent to take a view of the situation as replied by the SP himself. The success of such kind of interaction with the authorities and public is required. When people see that they are being heard more and more people will start sharing photos of offenders. I believe Delhi police is miles ahead in traffic violation management. good to hear about the positive attitude of the SP. Continue with the same Zeal Sir.